The Rogue Analog Delay pedal creates echo effects, from short slap-back to longer repeating echoes. Use it on electric guitars, electronic keyboards and more. 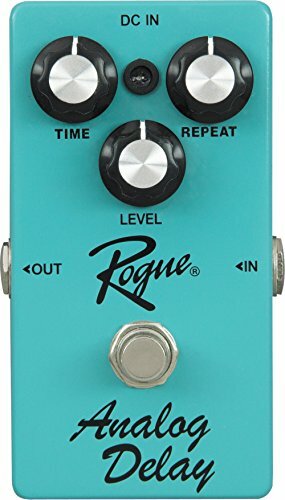 The Rogue Analog Delay pedal creates echo effects, from short slap-back to longer repeating echoes. Use it on electric guitars, electronic keyboards and more. Three control knobs let you quickly adjust the speed of the echo repeats, the number of echoes and overall volume of the effected sound. A true bypass switch engages and disengages the effect. An LED indicator shows you when the effect is engaged and gets dim when it's time to change the battery. The Rogue Analog Delay pedal is made of aluminum and built to last.